I have a day off today at SQL Connections while Kimberly and Jonathan educate the crowds about SQL Server 2012. I thought I'd mess around with my camera (we're driving through the Mojave Desert next weekend so have all our gear with us) and see what I could get. We're up on floor 38 of part of the MGM Grand and have a balcony (with a scarily flimsy barrier before a 450 ft drop!). Being this high opens up all kinds of opportunities for cool photos. Here's a wild fisheye view looking out over the airport. 1/400s at f/16, ISO 320, shooting fully manual with Canon 8-15mm f/4L Fisheye at 10mm and Canon 5D Mark II. Click for a 1572×1048 version (800K). 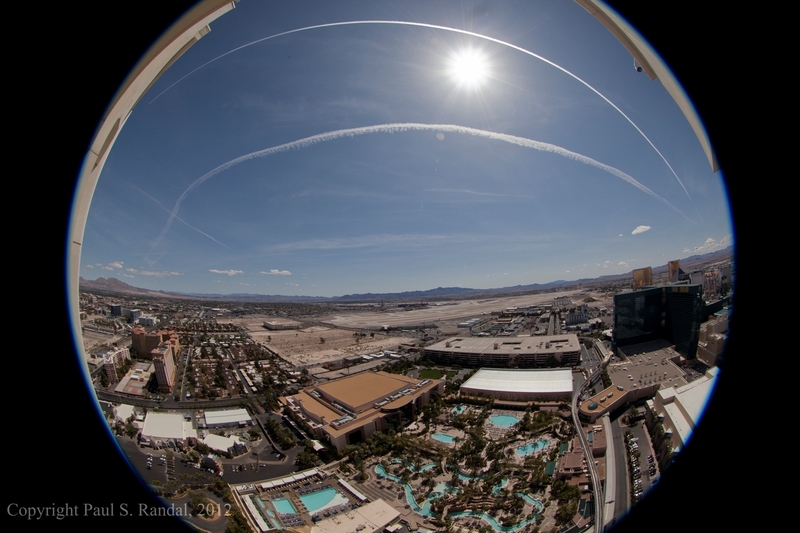 I love the effects I can get with this lens – I think the contrails look really cool! Survey: how do you run consistency checks? Three years ago I ran a survey about consistency checking methods. A lot has changed since then, including database sizes, 24×7 operations, and a lot more people reading my blog. I'd like to re-run that survey so we can all get a better idea of what the prevailing methodologies are these days. So, if you run consistency checks, how do you run them? I'll report on the results in a few weeks. I'll be updating a few interesting surveys over the coming months to see how things have changed. I love getting questions in email about SQL Server. I tell every class that they can send me questions and they'll get a response – sometimes just a URL to read, sometimes I engage for hours if it's a really interesting bug, for instance. It's a great way to help the community, it fosters good will for SQLskills.com (we're a business after all), and it provides me with some interesting real-life problems as source material for the various Q&A columns I write. Everybody wins. However, I've noticed a disturbing new trend – people sending questions which seem to demonstrate little or no thought, little or no research, and most irritating of all, little or no politeness. Please and thank-you cost nothing but seem to be sliding out of use during online communication. I mean, if you're going to ask someone for something for free, shouldn't you be polite about it and give them something reasonable to reply to? This afternoon I got a doozy, and I thought I'd share the anonymized conversation with you. I really didn't expect to be argued with in a response so I thought I'd engage and argue back. No, this doesn't show me in a particularly good light – sometimes (rarely) my irritation overrides my self-restraint and I reply with some mild invective – but the end result was worth it as now I can help him out. If only he'd started with the final email then none of this would have happened and you wouldn't be reading this. Problem statement(s) – but not 100s of lines of code with "Incorrect syntax near ','"
Enjoy! And keep the good questions coming! Interested in your thoughts… was I right? was I wrong? I hum'd and hah'd about blogging this at all, but I thought you'd find it interesting. What is the best source to study for the MCTS and MCITP certs.? Seriously? No please, no thank you and you expect a response? You've just made my day Mr Randall. Really. I've dreaded asking you questions in the past because I've seen you rip people to shreds for silly questions. I thought, Paul seems like a straight forward guy and doesn't need any fluff. Plus, he's busy. I figured a short and direct question would be best. I spent about 5 minutes contemplating how to craft my email. Even if you don't respond, it was a great pleasure just to be shot down by you. My co-workers will get a kick out of it. Please forgive me for wasting your time. I follow your work closely. It's made me a better DBA. I'm an insider and a big fan. Ok – you got my attention for 2 mins. Yes, yours was a really silly question. And you were not polite about it – if you follow my blog you'll see me railing against people who don't say please or thank-you for random questions, which I usually answer regardless. Did you do any research into answering your question? Google/Bing? As you know, we don't teach any of these certifications, and I don't think much of them, nor do I have any of them, so it's unlikely that I'll know the best source for studying for them. You didn't even specify which one you were interested in. And best in terms of what? Cost? Depth? Breadth? Material? Teacher? Yes, I'm very straightforward and very, very approachable – but I have no time for questions that really shouldn't be sent and occasionally when someone sends one with no politeness in, I respond as I did. You lucked in this week. Feel free to share this reply with your co-workers too. Btw – my last name is Randal, not Randall. It's in my email signature. Next time, ask a longer question, with more information, on a subject I'm likely to know about, plus say please and/or thank-you and you'll get a better response. When you get a free moment, would you please do me the honor of sharing some career advice. I'm at the point in my career where I can no long consider myself a newbie. However, I'm feel completely lost and direction less. I want to be an excellent, well rounded DBA, but I don't know the best way forward. I'm a very good Production DBA, but I feel I'm rubbish when it comes to planning and architecting a database environment. I know little about Network, Storage, Virtualization etc. I also have little to no experience with the SSRS,AS,IS. I can really geek-out of SQL internals; and as I mentioned I really wont to know how to have an intelligent conversation about Network, Storage, etc. I only mention the BI tools because it's good to have them in your tool belt. I just need a little bit of direction. I'm hungry, and I've been aggressively trying to plug learn, but I want to make sure I'm doing it the right way.